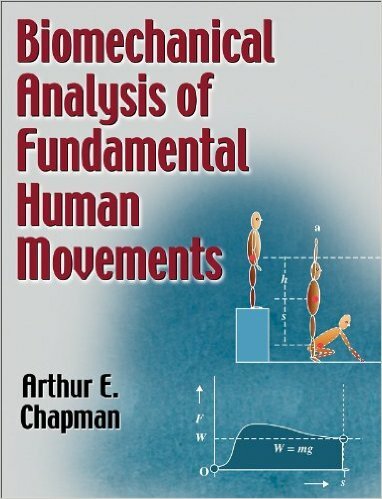 Arthur Chapman, "Biomechanical Analysis of Fundamental Human Movements"
Unlike previous biomechanics texts that have taken a mechanical concept and identified activities in which the concept is implicated, Biomechanical Analysis of Fundamental Human Movements takes a contrary approach by focusing on the activities and then identifying the biomechanical concepts that best facilitate understanding of those activities. Superbly illustrated with more than 140 figures depicting the critical points of biomechanical analysis, this two-color text is an invaluable tool for those pursuing the study of advanced quantitative biomechanics. It presents a clear introduction to the principles that underlie all human motion and provides a complete study of fundamental human movements and their components. Teachers of human movement, safety equipment designers, rehabilitation specialists, and students performing advanced research in the area of human biomechanics will appreciate the scientific and mathematical focus in the text. This focus allows readers to gain an understanding of human biomechanics that will enhance their ability to estimate or calculate loads applied to the body as a whole or induced in individual structures. Biomechanical Analysis of Fundamental Human Movements begins with a discussion of the principles of biomechanics and then continues into more advanced study involving the mechanical and mathematical bases for a range of fundamental human activities and their variations, including balance, slipping, falling, landing, walking, running, object manipulation, throwing, striking, catching, climbing, swinging, jumping, and airborne maneuvers. Each activity is analyzed using a specific seven-point format that helps readers identify the bimechanical concepts that explain how the movements are made and how they can be modified to correct problems. The seven points for analysis are aim, mechanics, biomechanics, variations, enhancement, safety, and practical examples that move from the simple to the more complex. More than 140 figures illustrate the points of analysis throughout the the text, providing readers with a clear depiction of both the mechanics and mathematics involved in human movements. The logical and sequential presentation of concepts in Biomechanical Analysis of Fundamental Human Movements is complemented by pedagogical elements that reinforce and expand the readers' understanding. Within each chapter, key points and highlight boxes summarize critical information, and recommended readings provide easy access to related reference material. For quick reference, students can refer to the glossary and the appendix containing a guide to key symbols representing mechanical variables and mechanical formulae. In addition, the text features more than 60 problems with answers, categorized by mechanical concept, for readers to test their understanding of biomechanical analysis. Biomechanical Analysis of Fundamental Human Movements provides a complete understanding of this branch of human biomechanics using mechanical, mathematical, and biological definitions and concepts. Its focus on fundamental human activities develops advanced analytical skills and provides a unique and valuable approach that facilitates mastery of a body of information and a method of analysis applicable to further study and research in human movement.